Shoppers will be able to park at advantageous rates and help a good cause this Christmas with 2 town centre car parks being made available by The Ancient Order of Forresters. Richardson Commercial will be opening the car parks based in Northcroft Lane and West Street for the 2 weekends before Christmas, that is the 11/12th and 18/19th December. 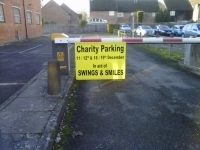 Paul Richardson commented "This is a great way to free up some much needed parking at Christmas and at the same time support Swings and Smiles a well known local Charity. Parking will be available for up to 50 cars at lower than usual town centre rates from 8.30 am until 6.00pm on the 2 weekends before Christmas"
A limited number of parking slots will also be available for the whole of December (Monday to Friday) at just �00per day (� per month). Further information is available from Paul Richardson on 01635 584188. .